Portland, Oregon, has always been at the forefront of America’s craft beer movement. Now, thanks to a new Kickstarter campaign, the state is getting the pint glass tribute it deserves. North Drinkware wanted to make a glass befitting Oregon’s love of beer. As the company states on its Kickstarter page, “Portland has the most breweries of any city in the world, and Portland leads the US for the percentage of dollars spent on craft beer.” In the spirit of all those handcrafted brews, they’ve created “The Oregon Pint,” a custom-blown pint glass made in Portland. But the real showstopper is the base, which features an indented 3-D model of Oregon’s highest peak, Mt. Hood. 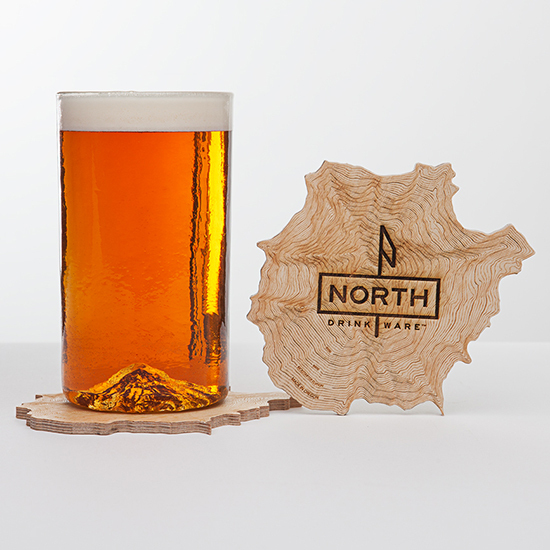 And not content with it just kind of looking like the iconic peak, North Drinkware used United States Geological Survey topographical data to build the model. The scheduled delivery date for The Oregon Pint is June, but with a couple thousand of these hand-blown glasses ordered so far, they might want to start blowing ASAP.